Editor’s note: Father William Franken offered the following homily at the May 28 Office for the Dead (vespers service) at St. Mary’s Seminary and University in Baltimore for Bishop William C. Newman. Father Franken is pastor of St. Joan of Arc in Aberdeen. He previously was pastor of St. John the Evangelist in Hydes, where he shared a rectory with Bishop Newman. We come together to pray and remember the life of Bishop William Newman, Father Bill to his family, and Bill to us priests. Bishop Newman’s episcopal model was “To live is Christ.” These few words speak volumes about him as a person. He was a priest and bishop who was loved by everyone who met him. Wherever he went, people would come and say hello to him because of his warm smile and his wonderful gift to remember everyone’s name. His nephew Bill told me that just a few days before his death, he was taking him to the dining room in assisted living. It took a long time. It was 45 minutes to get there because people wanted to talk to him. And just as long to get him back to his room. That was Bishop Newman, always ready to smile, talk, and be present to all those he would meet. He loved people whether they were rich, poor, imprisoned, or sick. He was indeed a blessing as a priest, bishop, brother, uncle, friend, or acquaintance. 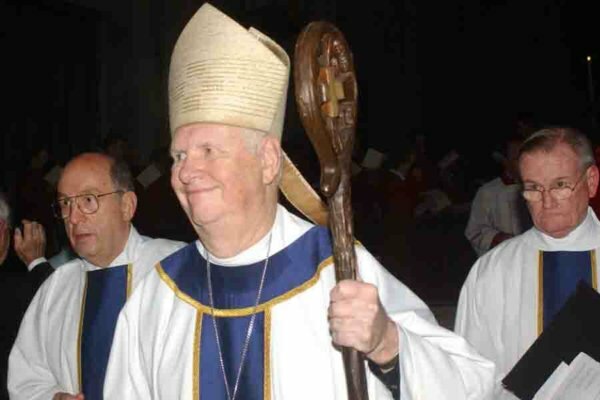 Notices of his death tell of a talented person whose diverse service to the church included parish priest, principal of St. Paul Latin High School, superintendent of Catholic schools, and auxiliary bishop. Archbishop Lori visited him before his death and found him to be the same ever-faithful, joyful, and gently man he was. He possessed the humility and peace of a bishop, priest and disciple of Jesus who looked not with fear but with hope and anticipation to meeting Jesus, the Lord of life. 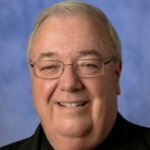 He was loved and admired and will long be remembered for his kind demeanor and his humble and generous service to the faithful of this archdiocese. As a priest, he was totally dedicated to his ministry. At St. Paul Latin HS, he taught a course in public speaking to the students. A story is told that one of his students had severe stage fright and stuttered in front of people. He took the student aside one day and said we’ll work together. The student became comfortable reading a scripture passage, and then, successfully read it again in front of a microphone. This student went on to become a captain for the Maryland Transportation Authority police and credits Bishop Newman with giving him the ability to testify in court, and was influential in him becoming a deacon for the Archdiocese. As Pastor of Ss. Philip and James, he brought his talents to revive a faith formation program and create new ministries there. Everyone who knew him described him as warm, wonderful, humble, and gracious. As Vicar Bishop, pastors, priests and people found him to be available and accessible. In celebrating many Confirmations, he felt it to be a privilege to be a channel of God’s grace, bringing the Holy Spirit upon the young people along the way. Bishop Newman had great affect for the priests of the Archdiocese. He enjoyed traveling on vacation to Florida and playing cards and going to the track with Monsignors McGowan, Schwallenberg and Lynch. He was most compassionate and caring for Monsignor Lynch in his last month on earth. Inspired by Pope Francis, He offered words of wisdom about the priesthood at his 60th anniversary (in 2014). He lived these words. Lead a simple life with a big touch of humility; don’t live a double life; be accountable for your priestly stewardship; focus on service to the people; be compassionate; be ministers of mercy; be a real agent of evangelization, not only in word, but indeed and in attitude; do not be afraid to have your shoes get soiled by the mud of the street. Most importantly, love the people! When he was superintendent of schools, he had the best penmanship of anyone his secretary had ever known. How true. When he was a student at Calvert Hall, he excelled in baseball and caught the eye of many baseball scouts. Bishop Newman was a great athlete. A peer who played baseball at the same time said the Pirates (team)were interested in him and that he was sure he would have made it in the big leagues. He chose the seminary instead. He was always choosing God and people first. If you ever watched a baseball game with him, it was enjoyable. His rule: Never walk the first batter up. Also, he could often tell what pitch the pitcher would throw. Baseball was a passion and a hobby. His first job was working for the sexton of Blessed Sacrament Church cleaning up the church and church hall after parish card parties. He also worked in a grocery store. On his first day of his first assignment at St. Elizabeth of Hungary Church, he parked in his new pastor’s parking space. You could take his right arm, but don’t take his parking space, Bishop Newman recalled. His good friend, Franny Meagher, golfed with Bishop Newman at Mount Pleasant. The worst swearing he would do on the golf course was the occasional Shakespearean “foresooth.” He described his friend as a sweetheart of a guy. In 1974 after serving nine years as superintendent, Bishop Newman asked the new Archbishop Borders to consider someone else for the job. It was the same year Bishop Newman had a heart attack. In 2003, 10 years before Pope Francis was elected, Bishop Newman saw the need for the church to be more missionary. It needs to go out where the presence of Christ and the love of Christ belongs, and bring it. Bishop Newman comes from a large family and he enjoyed being with them. They are great people, warm, friendly and welcoming. I enjoyed being with him and his family at family events such as Fourth of July. He proudly hung a handmade quilt of his family given to him as a gift at the rectory of St. John’s. He told me that his family was a blessing to him and how appreciative he was to have his nieces Trish and Dolora to help him get through his health challenges. He loved his family dearly. Bishop Newman made friends easily and some of them are here today. He and I were great friends who became especially close when he accepted my invitation to live at St. John, Hydes in 2001. Like all of you I loved him as a friend, brother priest and bishop. Despite his health issues, he endured his illnesses never complaining, the same joyful man, who accepted them as an opportunity to share in the suffering of Christ. He was a spiritual and prayerful person with a total trust in God and doing God’s will. I became a better priest living and ministering with him. Anyone who crossed his path became better as well. St. John the Evangelist Hydes was his faith community for 10 years. A parishioner said this about him: “He was an absolute gentleman and a wonderful priest. A true and dear friend. I cherish all the time I was fortunate to be in his presence. We are deeply saddened and yet celebrating his reward of being with Our Father in heaven.” That was Bill. When closing a card or letter, he signed off with “God’s best always.” The Sunday before his death he told me that he was ready to go home to the Lord. His parting words were “See you in eternity.” A few days later, he got his wish. Father William Franken is pastor of St. Joan of Arc in Aberdeen.